Picnic season is finally upon us! Now that the weather is nice, I am taking every opportunity possible to eat outdoors. One thing for sure about winters that last almost six months along, it makes you really appreciate the nice weather! 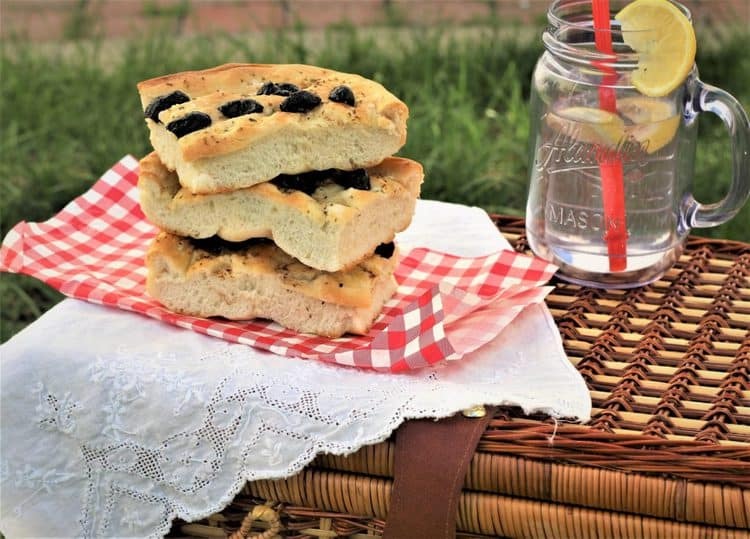 Focaccia has become a staple at our picnics, pool parties or when my kids invite their friends over. As a matter of fact, my daughter’s friends now specifically request my focaccia. 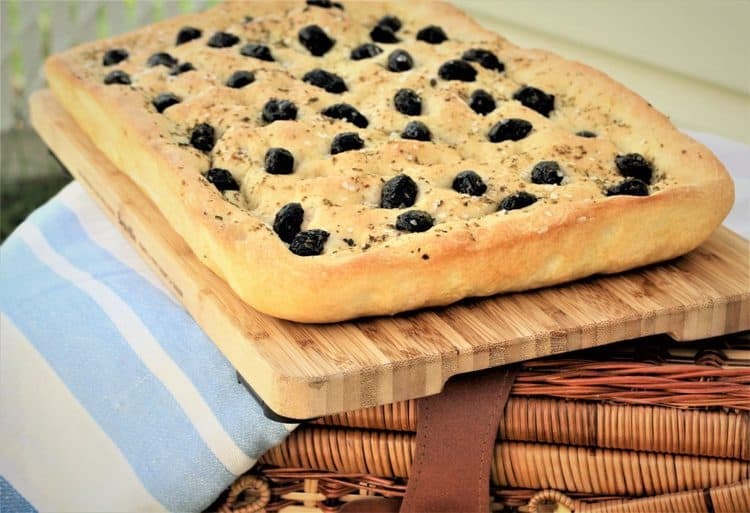 Many have asked me to share my recipe, so I present to you today Black Olive Focaccia! As opposed to pizza which tends to have a thinner, crisp crust, focaccia is much thicker crusted and has a spongier texture. Since it is so thick, I’ve seen people slice it in half, layer it with cold cuts and eat it as a sandwich. Toppings are also minimal therefore you’ll never find a thick layer of cheese piled on focaccia nor is it saucy. My focaccia toppings vary according to whom I’m making it for. My son prefers his with cherry tomatoes whereas my daughter will usually remove them. So for picky eaters, I usually stick to dried oregano and olive oil. 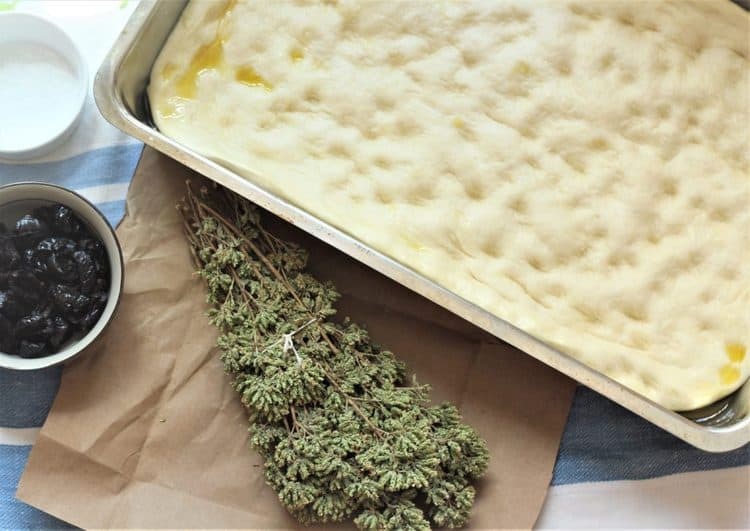 Regardless of your choice of topping, you must add dried herbs such as oregano and/or rosemary and of course, a light sprinkling of course salt for that salty flavor and crunch. 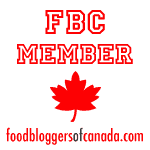 For the purposes of this blog post, I decided to use one of my favourite ingredients, black olives. But not those pitted, black olives from a can. Horrors! I love most olives, but I’m particularly fond of olive infornate or baked olives. Those are the small, shrivelled olives that are baked and salt and olive oil cured. These olives always remind me of Italy. When I was a child, each time a relative went to Italy, they brought back a container of these olives and I was immediately hooked. From then on, I made sure that they brought back nothing but these olives for me! In fact, I am now planning my strategy on how to bring back as many as possible upon my next trip. No matter what you choose to put on your focaccia, you must try this simple, no-fail recipe. 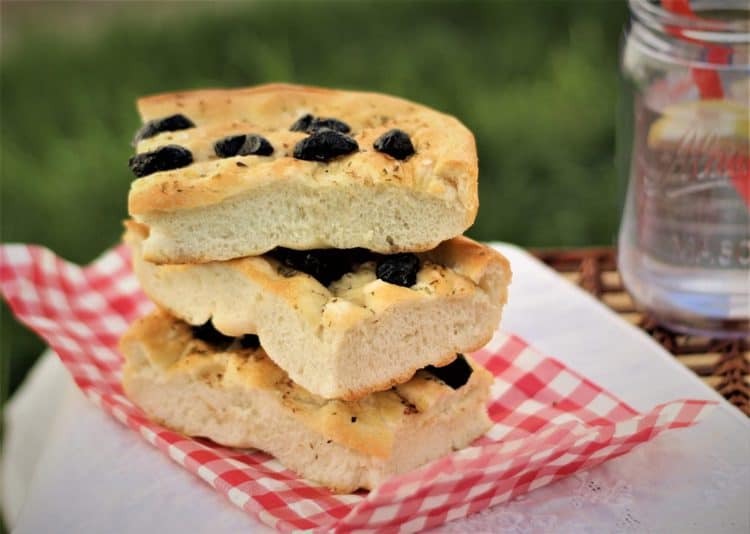 Even those most intimidated by making dough will find it easy and soon you’ll be adding this focaccia to your summer entertaining menu. Buon appetito! Summer is almost here and picnic season is upon us! 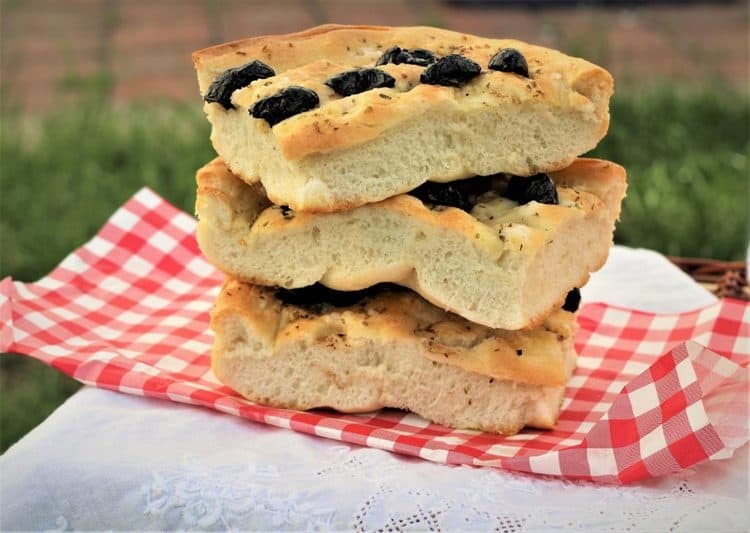 Black Olive Focaccia is a favourite for family picnics, BBQs, pool parties and entertaining kids. Making dough is easier than you thought! In the bowl of your stand mixer with the dough hook attached, combine the flour and salt. Once the yeast has proofed, stir in the sugar and olive oil. With the stand mixer on low speed, slowly pour the yeast mixture into the flour. Once the mixture is well combined, raise to medium speed and knead the dough for 10 minutes or until smooth and elastic. If necessary, turn the dough onto a lightly floured surface and continue to knead for a few more minutes by hand. Transfer the dough to an oiled bowl, turn to coat all sides of the dough. Cover with plastic wrap and place in a warm and draft free location to rise for 2 hours. The dough will have doubled in bulk. After 2 hours, without kneading the dough, transfer to a generously greased rectangular baking pan(mine is 10X16"). Use the tips of your fingers to spread out the dough so that it covers the entire surface of the pan. Do not use a rolling pin! Loosely cover with a dish towel and let sit for 30 minutes. Preheat oven to 425F. After the dough has rested for 30 minutes, make indentations with your fingers in the dough and spread 2 tbsp. of olive oil evenly over the surface. Place the olives on the dough and press lightly with your finger so they are nestled into the dough. Sprinkle evenly with course salt and oregano. Bake for 30-35 minutes, rotating the pan halfway through, until the dough is golden. Serve warm. 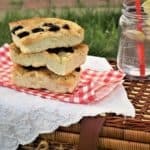 Nadia I adore focaccia and I agree it’s great to tag along on a picnic! Your ingredients are pretty much what I use as well...my but I love the addition of black olives! And now I’m craving some??? ?